Tsurumi Manufacturing Co., Ltd. was established in Japan in 1924 and has ever since been manufacturing, purchasing and selling various pumps and related equipment, -- submersible pumps are key products. Tsurumi's submersible pumps are applicable to difficult-to-handle liquids, such as seawater, corrosive liquids and high temperature liquids, as well as pumps for general wastewater. This article introduces Tsurumi's TM-series of submersible seawater pumps. The TM-series pumps are suitable for handling seawater. To prevent corrosion of metal parts, Tsurumi's submersible seawater pumps use titanium for all metal parts, including plugs, bolts and nuts, that come in contact with liquids. Titanium is suitable for handling seawater, but it is extremely expensive, which can make it disadvantageous in terms of material costs. To counter this problem, the TM-series pumps use titanium in combination with the same highly-functional resin that Tsurumi has adopted in its VANCS-series of resin pumps, so both problems -- resistance to seawater and cost -- are solved. Seawater is difficult to handle with general pumps if the pumps are not provided with countermeasures, because seawater causes corrosion, resulting in pump performance deterioration and, in the worst case, pump failure. In conventional applications for handling seawater, stainless steel pumps and submersible pumps with coated castings are used. However, stainless steel pumps suffer localized corrosion in the form of crevice corrosion and pitting corrosion, while cast pumps corrode as the coating peels off. The truth of the matter is that the service-life of these pumps is relatively short because of corrosion. In seawater handling applications, stainless steel pumps are generally used. However, stainless steel parts still suffer localized corrosion that eventually causes insulation failures due to water intrusion into the motor in a short period of time, which may result in unexpected cost increases. Stainless steel provides high corrosion resistance when a protective film of chromium oxide is formed on the surface. However, if the protective film is not maintained due to an oxygen shortage, corrosion resistance will be considerably reduced. For example, if packing or marine organisms (barnacles, etc.) adhere to the chromium oxide film, an oxygen shortage occurs under the adhering substances, so the chromium oxide film is not integral. If the pump is kept running in such a condition, localized corrosion occurs in the form of crevice corrosion and pitting corrosion. Therefore, even with stainless steel pumps, thorough caution is required. What this means is that stainless steel pumps are not absolutely resistant to seawater. As a result of our field tests using seawater, crevice corrosion occurred in the stainless steel motor frame, bolts, nuts and washers after about 6 months of operation. And, in particular, the motor shaft was extremely damaged by heavy corrosion. The following photographs show the condition of a VANCS-series pump (made of 304 stainless steel and resin) and TM-series pump (made of titanium and resin) after 6 months of operation in seawater. It is proven that the TM-series pump provides complete corrosion resistance to seawater. The TM-series of submersible seawater pumps feature a combination of titanium and resin, so they are lightweight, highly durable and very resistant to corrosion when handling seawater. Specifically, individual parts of the TM-series pumps are made of the most suitable resin for the purpose of use, so the TM-series pumps are more advantageous in terms of corrosion resistance and durability than pumps comprised of simple resin materials. The TM-series pumps are used for seawater circulation, intake and draining purposes. They use food-grade liquid paraffin for the lubricating oil, which is safe and fish-friendly when used in fish preserves, water tanks and fish farms. Also, the TM-series offer variations in discharge bore diameter (40 to 80 mm) and motor output capacities (0.25 to 3.7 kW; single phase available up to 0.75 kW motor output). Also, models that enable automatic operation are available. 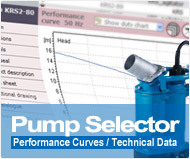 Users can select pump models suitable for the intended application. The TM-series pumps are equipped with an anti-wicking cable, inside mechanical seal with silicon carbide face, and an oil lifter as standard features, while the pump body is compact. For many years, as a pioneer of resin pumps, Tsurumi has researched pump designs that enable continuous stable duty for long periods of time even in harsh environments, while improving pump durability and maintainability. Owing to their stable quality, reliability and safety, Tsurumi products can be used without worry. As described above, Tsurumi has been developing pumps resistant to harsh conditions of use, by making use of the experience and know-how that the company has accumulated over many years. As a result, there are many products in Tsurumi's lineup that can withstand the brutal field conditions of moving and draining high temperature liquids, corrosive liquids and seawater.